Hutchings played youth football for Chelsea, then became a trainee with Brentford and going on to gain a professional contract in July 1993. He played 162 league games for the Bees, scoring 18 goals. Transferred to Bristol City in June 1998 for a fee of £130,000, Hutchings struggled to hold down a regular first team place and was loaned out to his former club, Brentford in February 2000, and then Exeter City in November 2000. His two league outings for the Grecians were against Plymouth Argyle and Chesterfield respectively, both ending in 2-0 defeats. 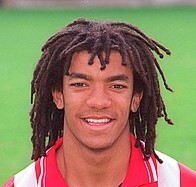 Returning to Bristol City, he quickly moved on to sign for Southend United in December 2000. Hutchings appeared in 43 league games for Southend, scoring 4 goals. He then signed for Leyton Orient in February 2002 and stayed there until the end of the following season, when he moved to Farnborough Town. Since retiring from football at the age of 29, it was reported that Hutchings had become a successful stock market trader and is also involved in sports management, with Eleven Sports Management, where he is a players liaison manager, and described as being an entrepreneur and public speaker specialising in wealth creation.